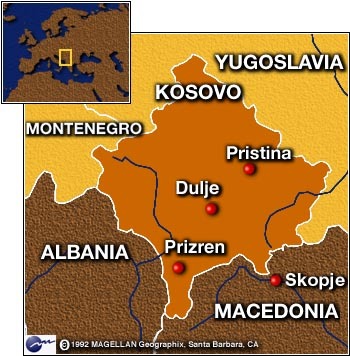 PRISTINA, Yugoslavia(CNN) -- Three separate shooting incidents in Kosovo on Sunday left four people dead and two others wounded, increasing tensions as an international peacekeeping force began to take charge in the province. In Prizren, German troops opened fire on a small yellow car carrying two Serbs through the city center. Witnesses said the car was driving toward a German armored personnel carrier -- surrounded by people celebrating the arrival of peacekeepers -- when the passenger displayed an AK-47 and opened fire. Troops on the carrier and a German tank returned fire. The driver of the car was killed and the passenger wounded. A German soldier on the carrier was injured. A relief worker from the international group World Vision who helped the wounded Serb said the man told him, "I am a Serb. I must die for my country." In Dulje, south of Pristina, two German journalists were shot and killed by an unknown assailant. One was shot in the head, and the other, shot in the stomach, died later at a Canadian military hospital. In Pristina, the provincial capital, British soldiers shot and killed a pistol-wielding reserve Serb police officer after he fired at least one round at a British patrol, said Lt. Col. Nick Clifford, a spokesman for KFOR, the international force patrolling Kosovo. "The patrol repeatedly warned the individual to stop or they would fire," Clifford said. "The individual continued to threaten the soldiers with his weapon, and fire was returned in self-defense." 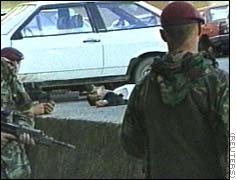 Both the shootings and the refusal of Russian troops to admit a British contingent into Pristina's airport underscored the tense nature of KFOR's march into Kosovo. KFOR peacekeepers in Pristina searched for an alternate base to replace one at the airport, where Russian troops turned away a British-led detachment in a move NATO's top general called "bizarre." British, U.S., French, German and Italian troops rolled into the province Saturday to begin Operation Joint Guardian. But a column of Russian troops unexpectedly beat the NATO peacekeepers into Pristina and blocked access to most of the airport by parking an armored troop carrier across a road. NATO and Russian officials were holding talks in Moscow, Macedonia and Kosovo in an effort to resolve the impasse and determine the role of Russian troops within KFOR. 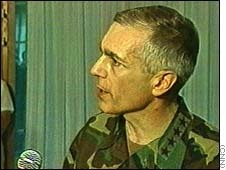 Gen. Wesley Clark, NATO's supreme commander, said the NATO- led KFOR peacekeeping mission was proceeding into the Yugoslav province on schedule. 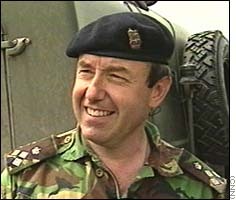 Clark said NATO could have as many as 10,000 KFOR troops in Kosovo by Sunday evening. "No plans have been disrupted whatsoever by this bizarre event," Clark said during a visit to Skopje, Macedonia, where allied troops have massed to move into Yugoslavia. Brig. Robert Baxter, the commander of the NATO detachment at the airfield, described his talks with Russian officers as "friendly." But they firmly refused to allow his troops into the airport. "They just told me we had no permission to go from his commanders," Baxter said. "I then asked him if he could speak to his commanders, and there were lots of shrugging of shoulders." The peacekeeping mission is one of the largest military undertakings in Europe since World War II. KFOR is preparing for the return of hundreds of thousands of Kosovar refugees displaced during the 11-week Yugoslav conflict and the year of ethnic strife that preceded it. Clark downplayed the military significance of the situation at the airport, since that was never going to be the main headquarters for KFOR, he said. He emphasized that diplomats -- not soldiers -- would find a solution. "This is essentially a political problem, and it has to be dealt with in a political manner," he said. Outside Pristina, the roads were full of military vehicles -- either Yugoslav troops on the way out or KFOR units on the way in. About a quarter of the Yugoslav army and special police units in Kosovo have left, U.S. Secretary of State Madeleine Albright said Sunday. Under the terms of the cease-fire agreement that ended NATO's 79-day air war against Yugoslavia, the Serb-led military and special police have until June 21 to leave Kosovo. Once their pullout is complete, a small contingent will be allowed to return to guard Serb historic sites. As the Yugoslav troops withdrew, many of Kosovo's Serbs went with them. In some parts of Pristina, they were taunted by ethnic Albanians who have spent much of the past three months hiding in their homes. Running a gauntlet of jeers and stones, a group of Serbs made its way out of the city through an ethnic Albanian neighborhood. Some were leaving forever; others planned to watch developments and return sometime in the future. Just days earlier, no one here would have dared to hurl even harsh language at Serb soldiers. But the presence of NATO troops has turned the tables. Many Albanians chanted "NATO, NATO" and "UCK, UCK" -- the Albanian acronym for the Kosovo Liberation Army, the ethnic Albanian rebel group that fought the Serbs for a year. But a fire damaged the library of Pristina's main mosque, and military officials suspect arson -- perhaps the work of Serb extremists striking a final blow before fleeing the city. Throughout the Yugoslav conflict, NATO accused Serb authorities in Kosovo of committing abuses and atrocities against the province's majority-Albanian population. Among those complaints were refugees' reports that Yugoslav troops and border guards stripped them of their identity papers as they fled the country. British troops around Pristina found evidence to back up those claims Sunday -- bags full of identity papers taken from evicted Kosovars during the war. "The kind of things we found were many, many individual identity cards like that, possibly a couple of thousand," one of the soldiers said. "This is in two hours' searching." He said the documents would be passed along to British officials and probably to the United Nations. Correspondents Mike Boettcher, Tom Mintier and Jim Clancy contributed to this report.